The Colson Corporation sold bicycles between 1917 and 1953, typically through retailers like Goodyear and Firestone. So why are you seeing one on a page about motorcycles? Because this first year Colson bicycle is equipped with a Smith Motor Wheel! Around 1910, Arthur William Wall developed a direct drive motor wheel to power a bicycle – it was the first to be powered by gasoline. 4 years later, manufacturing rights for the motor wheel were acquired by the A.O. Smith Corporation of Milwaukee, Wisconsin, and it led to what you see here. The wheel was powered by a 1-1.5 horsepower motor and it drove a 20 inch wheel. Mounting the motor wheel to the rear tire of a bicycle enabled a top speed of about 20 miles per hour with a fuel range of ~100 miles on a 1 gallon tank. Approximately 25,000 of the Smith Motor Wheels were produced. 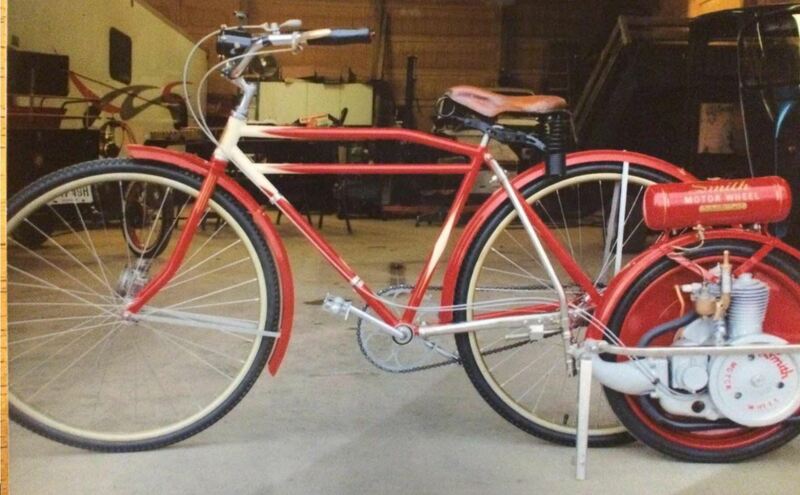 This bike (Serial #: #15404) utilizes a NOS 28″ Corbin rear hub with Lobdel wood wheels. The engine is said to have good spark and compression though it last ran two years ago. The motor has an Elkart mag and all parts are either original or NOS, there are no reproductions.